Andrea Robinson, of Mt. Sterling, was crowned the 2018 Fayette County Horse Queen on Monday at the Fayette County Fairgrounds Horse Arena. Robinson has been in 4-H for eight years and has served as Junior Fairboard and Jr. Superintendent member. Robinson goes to Miami Trace and is very active in FFA, she is a varsity cheerleader, band member, choir member and has been in several musicals. She has been a Fayette County horse participant for several years at the Ohio State Fair. Robinson (left) was crowned by Taylor Perkins, who was the 2017 Fayette County Horse Queen. https://www.recordherald.com/wp-content/uploads/sites/27/2018/06/web1_img027.jpgAndrea Robinson, of Mt. 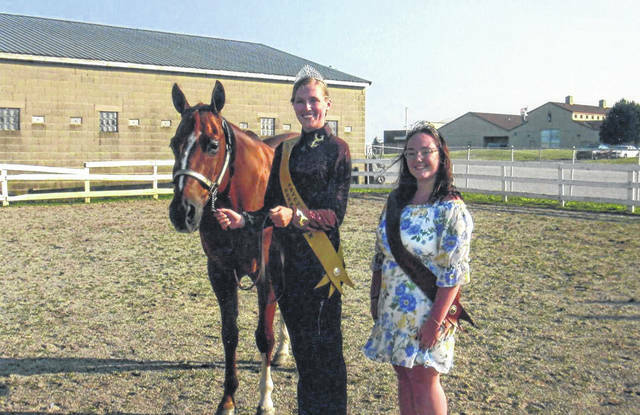 Sterling, was crowned the 2018 Fayette County Horse Queen on Monday at the Fayette County Fairgrounds Horse Arena. Robinson has been in 4-H for eight years and has served as Junior Fairboard and Jr. Superintendent member. Robinson goes to Miami Trace and is very active in FFA, she is a varsity cheerleader, band member, choir member and has been in several musicals. She has been a Fayette County horse participant for several years at the Ohio State Fair. Robinson (left) was crowned by Taylor Perkins, who was the 2017 Fayette County Horse Queen.